Pele fighting a losing battle with the barmaid, we think…. Well, this is the very question Emirates have tried to answer with two All Time Greats. 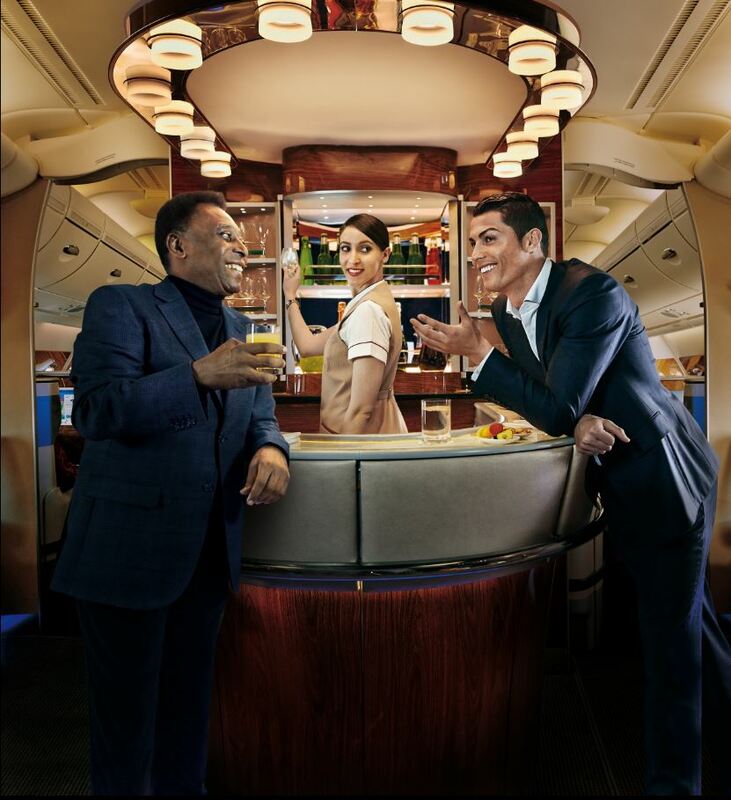 As Official Partner of the FIFA World Cup since 2006, the airline have announced that Real Madrid 'demi-god' Ronaldo is to become their latest global ambassador, joining the irrepressible Pelé. What better way to celebrate the coming together of two of football's biggest names than with a short sketch on board their flagship aircraft, with the pair unwittingly pitted against each other for the affection of the shell-shocked passengers? Ronaldo seems a good sport, showing off that trademark wink, all the while throwing cheeky grins haphazardly around the cabin. Pelé seems a little drunk to us, and with such a lavish bar and inviting bar staff, who could blame him! An effortless pro, the 73-year-old need only chuckle to match his Portuguese counterpart in the eyes of the gawping fans. But it doesn't really answer our question. Who would come out on top on the pitch, were their careers synced up, and would players like Messi or Maradona trump the pair? They say that a true test of footballing greatness is your performance in the biggest tournament on the planet, the FIFA World Cup. With that in mind, the old greats beat the young pretenders up until now, with Pelé and Maradona both setting the bar for the likes of Messi and Ronaldo to better. Neither have been able to take a World Cup by the scruff of the neck, but with Brazil 2014 only a few months away, the record books could well be rewritten, if the two best players in the world live up to their billing. Bring on the summer! Toni Kroos offered to Real Madrid by agent? Liverpool defender on way to AC Milan? PELE IZ D FOOTBALL GREAT OF IS TIME RONALDO IS THE BEST OF OUR TIME IN ALL ASPECTS. both are great footballer,pele was the best at his generation n c ronaldo is the best at his generation but at the moment pele is greatest footballer and I think c ronaldo could become like a pele of greatest footballer because c ronaldo is a incredible player when I saw the way he use to play in the field n he is a very very completed player.